Chef Tan Son Liang showcases his eclectic culinary background through daring flavour pairings, creative plating techniques and the sheer variety of his menu. Blû’s cuisine is Southwest- American with generous Italian and Asian influences. No matter what you are craving – be it sushi, pizza, pasta or exquisitely grilled Certified Angus Beef – you are bound to find a dish you will adore. The attentive wait staff, led by General Manager Costanzo Di Meglio, will ensure that you have a truly special experience. When it comes time to select your entree, a sure favourite is Blû’s slow grilled, fall-off-the-bone delicious BBQ short ribs. If you prefer seafood, try the wahoo choppino. Or, if you are a sushi connoisseur, treat yourself to the Bartoni Roll. This speciality dish consists of a medley of spicy tuna, salmon, yellow tail and salmon skin, topped with jalapeño and pineapple and finally drizzled with house sauce. In addition to its postcard-worthy view, Blû’s amenities and ample parking make it an enticing location for parties of all sizes and occasions. Blû now boasts a gorgeous private dining room (the 9th Hole) and the Soho Lounge, offering small plates and sushi. 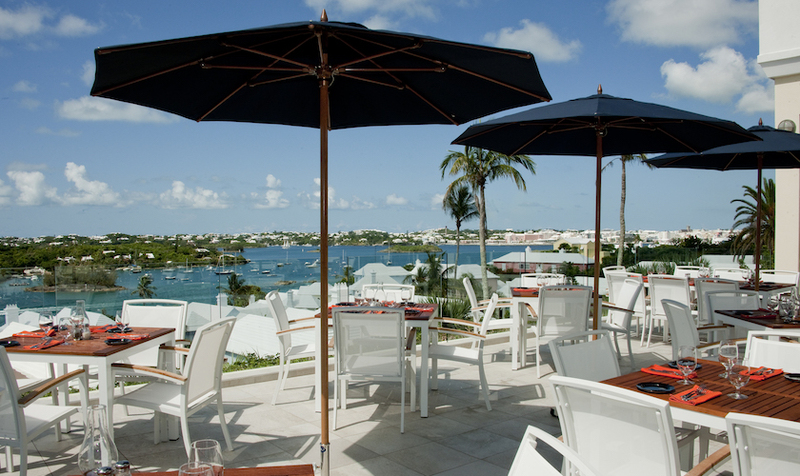 The popular American Deck provides the best spot to watch the sailing races and breathtaking Bermuda sunsets.